It is surprising to see a new book written by Joseph Campbell, who died in 1987, surprising and immensely gratifying. In Goddesses we get to enter into that mysterious world of myth from which we draw so much that touches us on an unconscious level and teaches us much about who we are as individuals, as a society, and as a species. The mythic archetypes explored in Campbell's many works, are metaphors for how we live and relate to one another and to those forces that we cannot understand but which shape us nonetheless. Joseph Campbell has been so tremendous an influence on contemporary life. Perhaps most of us were introduced to Campbell through the Bill Moyers interviews that are packaged under the name, The Power of Myth. It is certain, though, that a far larger audience was touched by his work through George Lucas's Star Wars trilogy which drew heavily on Campbell's mythological archetypes, particularly in The Hero's Journey. 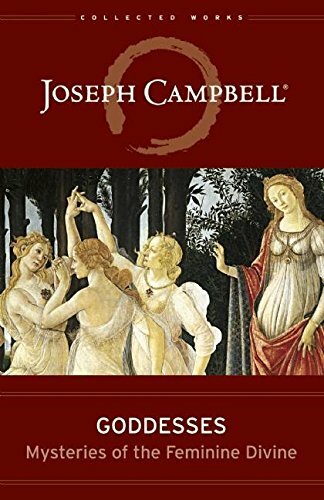 For those familiar with the Campbell’s other works, it goes without saying that these essays and lectures are well written, detailed, and informal in style less like academic papers and more like a conversation. We can almost see him sitting in a wing-back chair, laughing as he "holds forth" about a subject that is dear to him. Campbell fully believed in the value of myth, that our "collective dreams" teach us how to live. Beginning in 1934, he was a professor at Sarah Lawrence College which only went co-ed four years before his retirement in 1972. For most of his career, he taught young women. Little wonder then that searching mythic archetypes he should strive to present those which would resonate with his students and teach them about themselves. It is understandable why he should be drawn to the ancient goddesses. Writing about Joseph Campbell is such a daunting task! It seems that everything that could be said has already been said, but here we have a new work published under the auspices of the Joseph Campbell Foundation, called simply, Goddesses. At first glance, one wonders what more he could say about the eternal feminine that he has not already said, but according to the forward, this is the first time that a book devoted entirely to her has been compiled in one volume from heretofore unpublished lectures and essays. As such, it is exceedingly important. Where most of his other books mixed her up with the gods and heroes, this one is devoted entirely to her, the Mother, Sister, Lover. Goddesses is so rich in detail, so insightful; the connections between the goddesses of ancient Mesopotamia, India, Celtic Europe, Rome, Greece, Native Americans, and so many other cultures are compellingly drawn. It is important to state at the onset that Campbell believed in the "mono-myth,” that "all religions are true in a sense." The names and faces may change, but there is essentially only one basic mythology. Religions are largely cultural, and much of the book is devoted to how the manifested in different cultures throughout history. It is difficult to believe, after reading anything by him, that there is only one true religion when one sees the same themes repeated across cultural lines. According to Campbell, the worship of the goddess dates back thousands of years to the Paleolithic Age when humans recognized the female as the sole "giver of life." The male contribution to human reproduction was not known. It was a small step, then, to equate female fecundity to that of the earth which brought forth plants for the early hunter gatherers to eat. For several thousand years, throughout Europe and western Asia, worship of the Earth Mother prevailed, only to be undone with the incursion of Indo-European and Semitic warrior tribes. Demographers tell us that whenever there is population pressure on land, war is inevitable, and herding societies need a lot of land since their pattern is to overgraze and move on to greener pastures. Where agricultural societies tended toward the female, the bountiful earth, the desert people who were primarily nomadic herders tended to lean toward the masculine. So the god is all about the law and the goddess is all about nature. These conclusions have resulted in some accusations that Campbell was anti-Semitic, but there is a difference between acknowledging an historic and archeological fact and being prejudiced against Judaism or Jews. Campbell sees the crushing of the Goddess as a tragedy. He was ever conscious of what myth means to modern society. "Our myths teach us how to live," he said. So, how was the displacing of the Goddess affecting life today? It can be argued that it has resulted in the devaluation of the female in general, of owning women in the name of honoring them, a painfully twisted logic. In Goddesses Campbell attempts to restore the feminine to its rightful place in world mythology. She is the teacher, the muse, the one who initiates men into adulthood. “Where the male comes in you have division; where the female comes in you have union,” he writes. She is the center around which the male travels. She is the Earth that brings forth life and she is there to usher us into the afterlife. She is, as Edouard Shure writes in The Great Initiates, one third part of a universal Trinity with Fathergod as Power, Mothergod as Wisdom (Sophia) and the inevitable result of their union, the Divine Child as universal and unconditional Love. She must be treated with respect to insure her fecundity. And she will win. The Earth will win. She will not be defiled with impunity. Campbell traces her entire history from the early cave dwellers through her demise in the deserts of Asia to her resurgence in the iconography of the Church in the guise of Mary. But although the Mother of God she is ever virgin. That has had a profound effect on how we as a monotheistic society treat women and educate girls. Feminist writer Jessica Valenti asks us if we want women to be independent and self determined human beings who embrace life with enthusiasm, or do we want them to be commodities as many in the “Virginity Movement” would wish, things to adore, protect, own, buy, sell, and control? And there it is. If women are to enjoy the personal sovereignty that they deserve, they could do worse than these metaphors for the Divine Feminine. Joseph Campbell even 35 years after his death continues to influence us and advance the cause of human understanding through myth.